Tokyo 7th Sisters title screen. 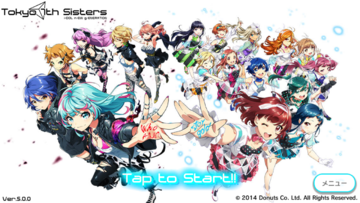 Tokyo 7th Sisters is a fully voiced rhythm + idol raising simulation game developed by Donuts, released in February 2014 for iOS and November 2014 for Android. In the year 2032, the legendary idol unit "7th Sisters" suddenly retired from the industry and disappeared. That was the end of the idol industry... until two years later, when a young glory-seeking employee is appointed to be the leader of Tokyo's next generation idol studio, "777 (Three Seven)", commonly referred to as Nanastar. However, the city continues to believe that idols are a thing of the past, and Nanastar is no exception. Their slump continues, but one day a mysterious and beautiful female manager approaches you and says, "If the idols of the past are gone, we'll just have to make new idols! True "sisters" linked by powerful bonds!" The story of the idols of the future, the Nanastar Sisters, will now unfold. Questions? Comments? Visit #fang-tan@irc.rizon.net or hit up @T7S_english on Twitter. The aforementioned Twitter account is also now used for translated announcement summaries as they come on Twitter. Need somewhere to start? Check out this page for a list of things that could use some help. If you wish to contribute to the wiki, contact A-zu-ra on Twitter (@JohtoKen) or NEW fill out this form. Visit the gameplay section for more information! A higher chance to obtain P Cards from the Seventh Sisters! Increase your scores with the new G+ cards! The latest episode has been released and can be viewed by unlocking using EPISODE 3.0 keys. Old news can be found here. Please note that this is a new game and it will take me a while to figure everything out and get it on here. As always, if you have questions you can go to our IRC channel #fang-tan on Rizon, or send me a tweet (@shininyan @JohtoKen). Gameplay has been fleshed out. Won't be able to add much more until progressing farther in the game. Items are mostly done. Just have to finish the collect sets and add pictures. All images have been added. Won't be able to update the collect set names/locations/etc until I actually reach those zones. A-zu-ra will be working on this wiki; updates have been made to the Gameplay, FAQ, and Main Story pages to reflect changes on the game revamp, as well as all currently released chapters. Due to school work, A-zu-ra may be going slow on miscellaneous updates to this wiki. He will keep events and campaigns up to date, on the other hand; it's only the other existing pages that will be slow for now. A to-do list for this wiki has been compiled and can be found in the Discussion page of the wiki index. Ping @JohtoKen on Twitter or contact A-zu-ra on #fang-tan on Rizon if you wish to obtain an account for the T7S wiki. Templates are in the process of being made and existing ones revamped. The Character template has been elaborated on and there are now two new card templates. Hopefully this will streamline some things for this wiki. A Style Guide is now in progress. More will be added to this when A-zu-ra gets the chance. Internet problems are now fixed; updates will resume as normal. IT'S BEEN A WHILE. LET'S FIX THAT. Opened up a Google Form for people that want to sign up outside of asking me on Twitter. I will answer responses to this form ASAP. I'll also probably get back to editing this wiki since some things have become severely outdated. NEW We now have a Discord! I'll be sending e-mails to anyone that requested an account through the Google Form about this. Anyone from hereon out that signs up through the Google Form will also get an invite. This page was last modified on 30 December 2017, at 15:20. This page has been accessed 647,619 times.